Abstract Logix has posted a new interview with drummer Jeff Sipe. In the two-part interview, conducted by Rod Sibley, Sipe discusses the recent Improvision album he recorded with Alex Machacek and Matthew Garrison, his time playing with Shawn Lane and Jonas Hellborg, and much more. Since I likely won't be posting for about a week, I wanted to leave you with something cool. Here's one of my favorite Shawn Lane YouTube videos. This is Shawn with the band DDT (which later became the North Mississippi Allstars) playing "Peace In Mississippi" at Newby's, Memphis, TN. - 1/27/95. Enjoy! Shawn Lane's Powers Of Ten album re-released with bonus tracks! Great news! 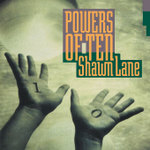 The late great Shawn Lane's "Power's Of Ten" album has been re-released by Eye Reckon Records. This was a monumental record that was first released in 1992 on Warner Bros, but has been out of print for a long time. The new release features 3 bonus tracks that did not appear on the original CD. Here's some classic Shawn Lane, live at Atlanta Drums & Percussion in August of 1996. This is an excerpt from the song "Rice With The Angels" with Jonas Hellborg - bass, and Jeff Sipe - drums. Depending on who you ask, Shawn Lane was arguably the greatest guitar player who ever lived. I first heard Shawn on the 1991 MVP - Centrifugal Funk album, then through bootleg tapes I acquired while a student at GIT in 1992. He floored me completely. In my opinion, his chops and musicality remain unparalleled to this day (sadly, Lane passed away in 2003). Lane's first solo album, Powers Of Ten, was released in '92 as well. He came to GIT in February of '93 and played an infamous gig which I was lucky enough to attend (my friends and I also got to meet and hang out with Shawn backstage after the show). Powers Of Ten was a very commercial-sounding album. Similar in vein to the instrumental work Eric Johnson was doing at the time. It appeared back then that Lane's future work would follow along the same lines. Then he met bassist Jonas Hellborg. Hellborg met Lane in 1994, and turned him on to the Indian and Pakistani influences he was exploring. Hellborg's 'Abstract Logic' album, recorded in December of 1994 with 17 year old (!) Kofi Baker on drums, marked their first collaboration. Hellborg has re-mixed, re-mastered, and re-released this landmark fusion album with 2 previously unreleased songs included. When you hear the music on this CD, it's hard to believe it was only 2 years earlier that Lane released the Powers Of Ten album. By comparison, the music on Abstract Logic is radically different. The writing and playing here is rich with various non-western influences. This album marked the beginning of a whole new direction for Lane. The new mix sounds crisper than the original. There seems to be more separation between the instruments. It's sounds louder as well, more raw. The album art is new also. The opening track, 'Serpents And Pigs', is a good example of what Hellborg's collaboration with Lane would sound like for years to come. The main parts of the tune are pretty exotic. Lane sings along with the main melody, which he did in many future recordings and live performances (sort of like an Indian-music version of George Benson). Then, for the solo section, Hellborg and Lane trade off for a bit before Lane starts his solo over a grinding 4/4 shuffle groove. If you've never heard this track before, the lick Lane plays about 3 minutes in may cause uncontrollable convulsions in the listener. You've been warned. Some of the songs are longer than they were on the original release. The most interesting example of this is shown in 'Throwing Elephant And Wrestling', one of my favorites from the original. The version here is almost a full minute longer than the originally released version. There's a long bass solo in the middle of the tune. The solo is periodically broken up by a short motif played in unison between the guitar and bass. In the original, the same motif comes around a few times before the groove changes and Lane's solo begins. In the re-released version, that same line is played, but so is a whole new line that did not appear on the original release at all. They go back to that a few times as well before the guitar solo, which ends up extending the length of the tune. Hellborg must have edited the song down for the original, and now he's giving us the whole performance. 'Rice With The Angels' is another great track. This song became a Hellborg/Lane classic that they played live quite a bit. Each player has a solo spot on the album as well. Lane's is a piano piece entitled 'Pluie D'etincelles'. Most people think of Lane as an incredible guitarist, but he was a highly accomplished pianist as well. What a musician. And the solo drum track, 'Put The Shoe On The Other Foot', makes it's hard to believe Kofi Baker was only 17 at the time of this recording. The 2 new songs are 'A Handful Of Earth', and 'Don't Look Back', both written by Hellborg. The band as a whole doesn't sound as tight on these songs as they do on the others. These 2 recordings were probably deemed too raw or unpolished to make the cut 12 years ago. But that's what I like to see in a reissued album; give me something I don't have yet if I already own the original release (which I do). 'A Handful Of Earth' has a decent solo by Lane, in a cool harmonic minor/phrygian-dominant tonality. 'Don't Look Back' is an odd one. One part has Lane playing these exotic lines with a backwards guitar effect. Another part, however, is a very mainstream-sounding doublestop rhythm part. The question you may be asking is, "If I already own the original release, should I buy this one as well". For diehard Shawn Lane or Jonas Hellborg fans, my answer would be yes. It's worth it to have the 2 new tracks, and to hear the re-mixed originals. If you don't have this album yet, you should absolutely pick this up. Not only is the music incredible, but it's a point of historical significance in Shawn Lane's career, which you will want to experience. The re-issued Abstract Logic is available now through Abstractlogix.com (where'd they get that name I wonder?) It will be released through other outlets on 8/15.